Our trademarked Pink Brew Glitter™ is the perfect compliment to any beverage to add some shimmery, sparkly pizzazz to your next festive occasion! This listing is for our standard 4g Brew Glitter Jar! Need more than our standard 4g Jar sizes? We also sell in bulk! Our bulk size beverage glitters come in 25g jars, 50g jars or 1 lb bags at significant price reductions compared to our standard 4g jar prices-- our bulk sizes are perfect for large parties, catering companies, wedding party planners, breweries, or restaurants looking for steep discounts & wholesale pricing. Our Brew Glitters are a food-grade safe, edible glitter dust that can be stirred into any beverage for a shimmery, glimmer, glittery effect! Sprinkle in beer, alcoholic beverages, sparkling water, juice, tea, champagne, wine, coffee, spirits and more! 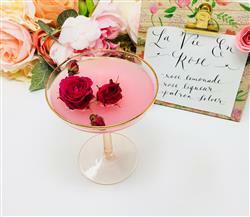 Perfect for signature drinks for wedding! Made in the USA and shipped from our Southern CA location! *Note: Our Brew Glitter™ will not dissolve, however it will settle to the bottom if left unattended for long periods of time. Simply stir & serve and watch your guests be amazed as the beverage glitters and swirls in front of them! Love bakells brew glitter ! This color is beautiful and perfect for Valentine’s Day! Jessica, as always.... your product photo's are STUNNING! Every change we get our team tells everyone to go checkout your IG page! It's so great!